If you are looking for a robust Content Management System that is SEO friendly, then you should think about getting Drupal 7. 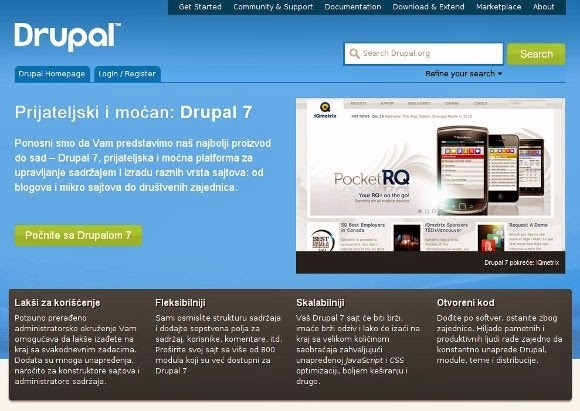 What makes Drupal 7 stand out tall are the functionalities that it comes with or can be incorporated. For example, it supports the use of Cascading Style Sheet aggregation and clean URLs. Instead of using a URL that ends with funny character like the clean URLs will get rid of this confusing characters to have one without these parameters such as node. This mechanism has highly been regarded as one of the best tools that Drupal do offer. The site is easily loaded simply because of the CSS aggregation. The CSS aggregation functionalities compress several files into one large file hence speeding up the loading process and this in regard benefit search engine’s robot and users. The ability of Drupal 7 modules is what is considered to make it more powerful. Have a look at the following Top 15 SEO Modules for Drupal Enabled Website. This is a module that provides list of allowed SEO practices. It mainly gives you multiple best SEO practices and also asks you to install certain modules. Once you have done a certain recommendation, this checklist will timestamp that and directs you to the next procedure. This module is used to check for any updated or nodes that can be used to better seo. It revolves around checking keywords, compliance and basic SEO. The SEO Compliance Checker will check for any errors or rather malpractices in your SEO practices. The Meta tags module as its name suggest customize Meta tag for search engine optimization. Other than that, it also edits the tag used for title. No need to install other module to take care of the title because this will do. This module that is used to generate similar URLs using certain pre-set patterns. It utilizes tokens to create this alias URLs. The good thing about the Pathauto is that it supports taxonomy, users and nodes. Using its API, users can have their contents bearing Pathauto own generated URLs that are SEO friendly. A module that creates a customized URL that can bear the name of the user. For example, instead of using /user/11, it will change it to /user/Ian. This one is more convincing than the Pathauto itself. The main goal of this module is to hide any related URLs by simply trying to find any alias of the original. This is done to ensure that a robot does not come across URLs that are not wanted. It will authenticate the URLs to ensure that the one to be used by authorized users does not leak. This one will automatically create several sitemaps basing on the settings that you instruct. The sitemap will then be submitted into several search engines such as Google and Bing. Sitemaps is one crucial tools used for bookmarking by search engines. This module is used for authentication purposes by search engines. You don’t have to add the Meta tags but this module will do that task. It simply adds the code of Google Analytics to your site. The best way to use Google Analytics is to use it in its default setting. To configure it, you locate UA-## from the Google Analytics site and make the default settings and save. It does the task of combining and integrates several search engine info such as optimization tools, reports, visitor analytics just a few of the data. It is flexible in that it offers an exclusive dashboard that has both webmaster analytics and tools. The Drupal SEO tools comes pre-installed with settings for titles, content, redirects, analytics and other webmaster tools. Just as its name suggest, it redirects visitors who have encountered a 404 error page to a relevant site. The search page results will be obtained based on the keyword. When a user gets this error, he/she will be taken to a site that has the same keyword and specifically your site. It automatically creates a block of sitemap that can easily be inserted to any part of your site. It does this by searching the relevant links which can then be placed to search engines. It is similar to many and plays a role of studying the nodes to establish if they have used the correct SEO practices. The Content Optimizer Module will also offer statistic and what needs to be done for SEO. It is more of an authorship tool than just a module. It is used for Google Authorship information which in turn helps in ranking. It links Drupal and Google + profiles thus increasing your chances of being indexed. If you want to share something just leave it in the comments below.